Wine Bar 38, is a three-story wine bar located on one of the main street, Dong Khoi. The name of the bar represents the street address, so it is not very hard to find. As is to be expected, the bar has a good selection of French wines. Additionally I saw some Riesling from Mosel, Sauvignon Blanc from Marlborough (Australia) and white Bordeaux. I was mainly eyeing the whites as it has been so hot. The bar has two dispensing machines, one for red and one for white wines for having tasters. Both fit six bottles. There is a happy hour between 5 and 7 pm. when all wines are 50%. Good deal if you ask me, as the price for a glass drops to a few euros (50-85K Vietnamese Dong). Wine Embassy is also located in district 1, just off the main street, Dong Khoi. The wine embassy has an even better selection of wines by the glass, and they offer small portions from 4cl and up. Wine Embassy also organizes tastings and wine classes. They serve everything from Riedel glassware. This bar is a touch up in wine-professionalism from Bar 38. The wine selection is very similar, heavy on France as well as Australia and other New World wines. Happy hour is also from 5 to 7 pm with a lovely 50% off, so you will not end up paying an arm and a leg as long as you keep your eyes on the clock. Annam Gourmet Market is the place to go if you want to buy wine. You will not find a bargain, but if you want a bottle of champagne, the selection is ok. Ok for Asia I mean. 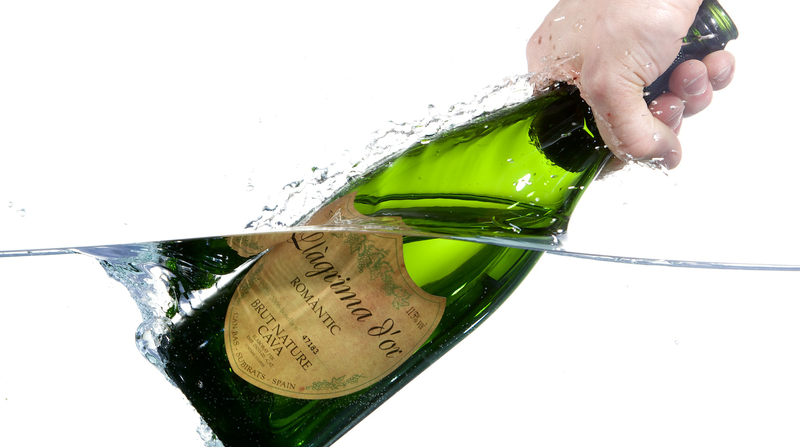 You have a selection of around 20-30 bubblies including also some finer wines like a Krug Grande Cuvee. The champagnes start from around 700K Vietnamese Dong (around 30€). The shop has also other foods and treats. Keep your eyes open though, many western products are quite unreasonably priced, so you will find a better bargain on a box of sweets somewhere else. This was my first time in Saigon, so I think we just scratched the surface. I am sure there are some even better wine spots in the city. We had such a good selection at the hotel lounge, that we did not really go out and explore that much. Our hotel, the Sofitel Saigon Plaza, also has a decent bar in the lobby, as well as we read up about the roof top bar at the Sheraton being quite ok. So if you don’t have time for much research, the hotels seem to carry an ok selection (and the prices weren’t that bad). This was it from Ho Chi Minh City. Next time I will be writing to you from Singapore. Well hello London! We meet again. Yesterday I stepped of the plane at Heathrow airport to a welcoming 18 degrees (C) and could feel I had come home. My days of actually living in London were short(ish), only one and a half years, but it always feels like the place I am supposed to be. This trip is going to be brief. We are here for two reasons; the main being a visit to London Cru, an urban winery in the heart of the city (Fullham), and the second being food. The rest of the trip, we intend on eating and drinking at nice restaurants. You might call it market research, but I would be lying if I would say it is not enjoyable. Who said work always needs to be boring. 1. A trip to London would not be complete without a pop into the Sampler (the South-Kensington branch), one of the best wine-shops in town. Even if I am not buying, I love that they have a wide range of wines in the sampling machines as well as some sparklings by the glass. One can just pour a small taster into a Riedel Vinum and walk around the shop (or stand by the Champagne shelf drooling as I do it). Click here for a complete review of the Sampler from January. 2. The Winery is a small piece of Germany located close to Warwick Avenue tube. The shop houses a wonderful selection of mainly German, Austrian and French wines. If you are a friend of Pinot, this is the shop to come to for some interesting German Spätburgunder. 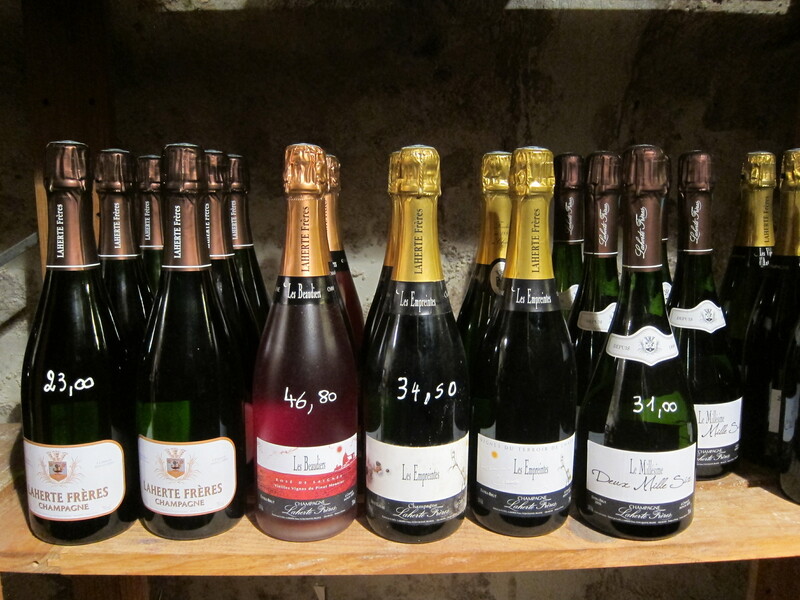 We also found some wonderful Marie Noelle Ledru Champagne here the last time we visited. Her wines are only available in London through the Winery. Here is a full review of the Winery from January. 3. Our newest find is Vagabond wines. It is a fairly similar to the Sampler, a wine shop and sampling house. Vagabond is perhaps one step more towards being a bar than a shop and is quite crowded with afterworkers in the evening. The selection is also slightly heavier on Spain and new world wines while the sampler houses one of the best champagne selections in the city (grower champagnes I might add). Vagabond also has a nice amount of sampling machines for trying out different wines as well as wines by the glass. What I particularly enjoyed was their charcuterie board that could be ordered as a companion for the wines. Here is a post about Vagabond from our last trip in January. There are many more shops that I like visiting, but these are my absolute favorite ones. Perhaps it is because you can have a glass of wine while shopping. All in all, I love the variety of shops in London and wish we could have such a selection in Stockholm. Perhaps some day…one can always dream. I love wine shopping! These days, I can go on for days just touring wine boutiques and lugging around bottles in a backpack. Or usually it is M who does most of the heavy lifting, but I am there for moral support. As this is an activity we enjoy, we made some time, while in Reims last week, to go around browsing in a few boutiques. Our agenda was to find some nice souvenirs for taking home that could not be bought in Sweden, and also finding a wedding present for a couple who is getting married this Friday. Reims can be quite touristy when it comes to wine, but we got some nice tips from the staff at G.H. Mumm and found a place that well suited our consumption needs. 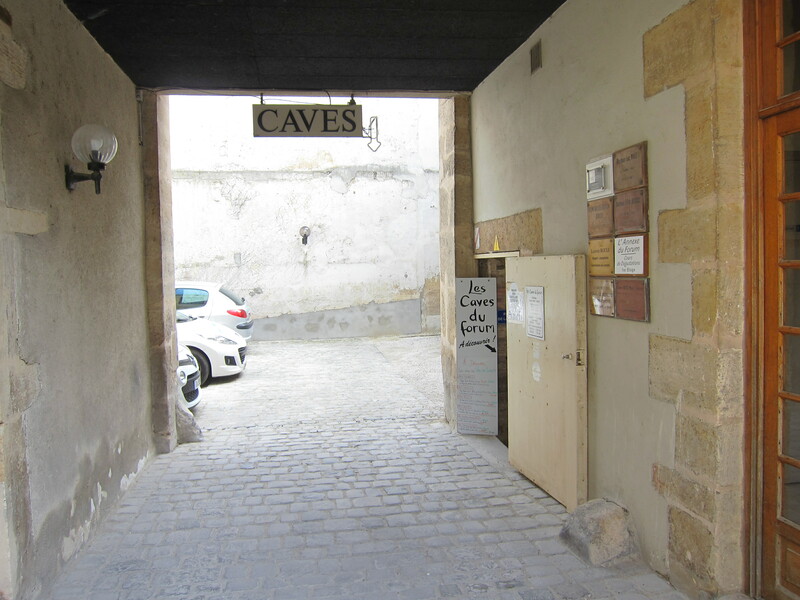 Les Caves du Forum is a large shop in an underground cellar next to the Reims Center (10 Rue Courmeaux). You need to first enter an inner yard before you see the entrance, but after that it is quite obvious, the red blinking arrow gives the location away. 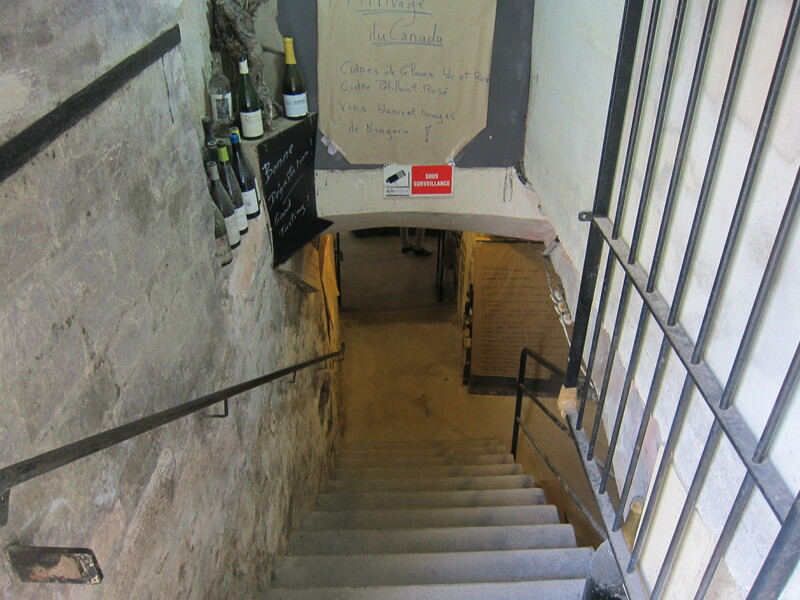 The wine shop is a few sets of stairs down in a cool cellar. The temperature and humidity are almost optimal for storing wines and the space gets no sunlight. Browsing around you can see that some of the bottles have been there for a while, judging from the amount of dust they have gathered. 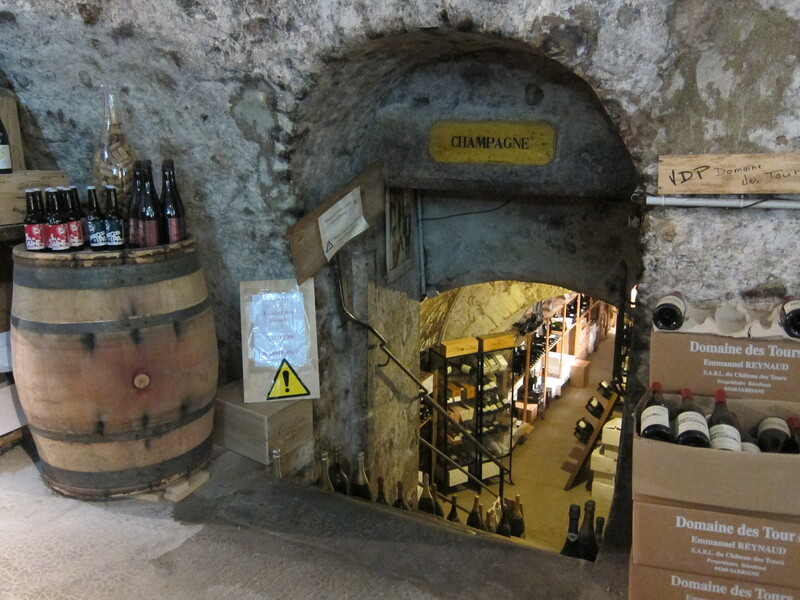 It is like a cave of treasures awaiting for the winecurious to rummage around. Regardless of a great selection of French and other red and white wines, we headed directly towards the section for sparkling wines. We were in Reims and there to source champagne, so that was what we were there for. And my oh my, what a treat! The champagne room, located another set of stairs down from the main floor was big and plentiful. The big brands were of course represented, but the selection consisted mostly of small producers and grower champagnes. I am not sure, but I don’t think I saw one bottle of non vintage Möet or Veuev Cliquot on the shelves. Instead I saw names like Eric Rodez, Savart, Laherte & Fills, Marie-Noelle Ledru etc. Many of these producers we had just met at Terres & Vins de Champagne a few blocks away. It was truly an inspiring view. We could have gone crazy in this store. I am sure it would have been no problem to find 20 or 30 bottles that we would have wanted to bring home. However, that was not really an option. So we settled for a bottle of Savart and Francis Boulard and made our way to the cashier. We did not see that many vintages on the shelves, so the wedding present would have to be found somewhere else. 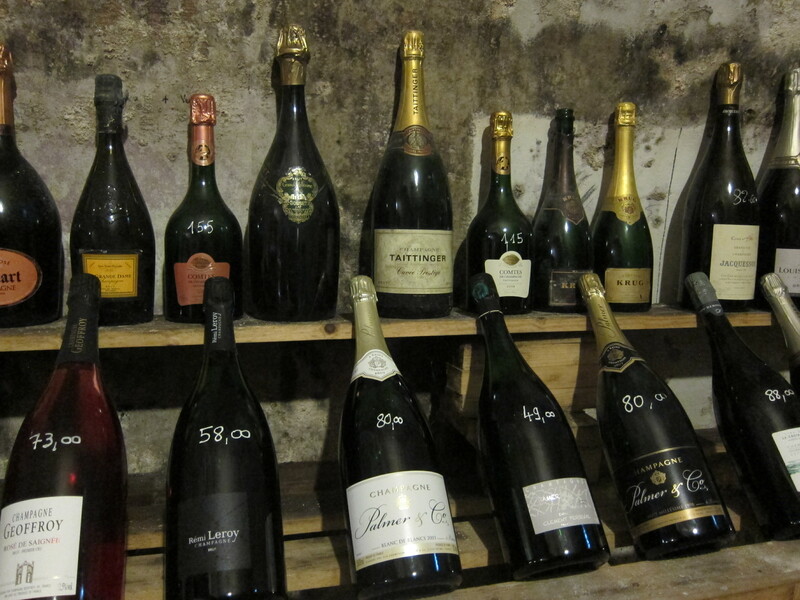 But all in all a wonderful selection of grower champagnes for very affordable prices. All in all a wonderful shop. I was not only impressed by the selection but also the conditions the wines where kept in. We did not have that much time to browse through the white and red wines, but we did see some interesting stuff peeking out from amongst the shelves. For example, the section for non-traditional wine countries, while small, featured not only Canada but also Slovakia and Palestine; this is really a shop to feed ones curiosity. 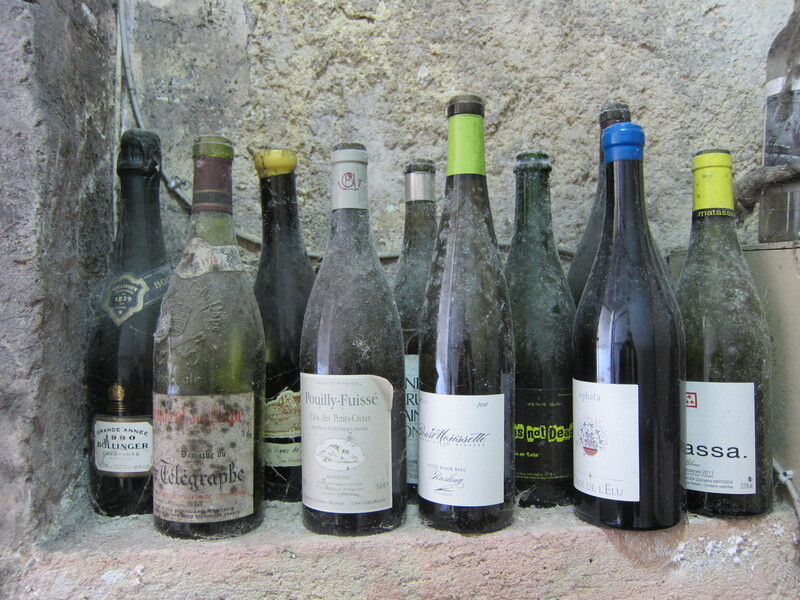 The strength when it comes to reds and whites did however, understandably, appear to be to domestic French wines. So if in Reims and in the mood for some shopping, Les Caves du Forum is the place to go. Happy Easter everyone and greetings from Helsinki! We have been celebrating the holidays by having a visit by the flu. Luckily this one is not very persistant, as I am starting to feel better already, but still it meant that a lot of our wine-plans had to be cancelled. We did have, however, some time on Thursday to browse around at the local delicatesse, the Finnish alcohol monopoly, Alko. As with Systembolaget in Sweden, Alko is the only company that is allowed to sell drinks above 5% alcohol content (in Swden it is avtually even lower than that). That means that many beers, wine and licqueur are all sold through this chain of shops. I am in general opposed to monopolizing this kind of business, as I don’t believe in the constraining effect of a single channel, however if that’s how things are, at least the shop should be good. That is one of the great things about Systembolaget in Sweden, at least they made it a hell of a good shop. Alko in Finland is a bit behind in selection, but perhaps it is also because we Finns are just discovering the European culture of enjoying wine as a part of a culinary experience as opposed to chucking it down at house parties directly from the bottle (or perhaps its just me). Before we were struck by the flu, we had time to visit the flagship store of Alko, in Kamppi, Helsinki. If you shop somewhere for alcohlic beverages in Finland, it should be here. The store has two floors, one floor for beer and licqueur and one for wine. We headed of course to the bottom floor wher they keep the bubblies. On the bottom floor they also have some well trained staff to help you with selection of your drinks. I must say that the Champagne selection has improved a lot over the past 3-5 years (after I moved away from Finland). There is a large corner just dedicated for the fine bubbly drink with both pocket friendly (25-35€) champagnes as well as top end (100-200€). Well not top end, but those 500€ babies are seldom on the shelf of a shop anyway. There is not that much small producer stuff, but neither is there in Sweden, so they are perhaps forgiven. The selection on other sparkling wine is actually very good with Cavas, Proseccos and new world sparklings taking up twice as much shelfspace as the champagne. This is something that is different from Sweden (there the focus is clearly on Chanpagne). This time we did not browse too much around the other wine-sections as it was Thursday evening and the shop was quite crowded. But I did see from the corner of my eye a nice selection of craft beer and other seasonal drinks. There was also quite a lot of gift wrapping materials, so if in need of a quick present, this is the place to swing by. Unfortunately only a few branches of Alko live up to the standards of the flagship store. Many branches dont carry such a wide selection of bubblies and they focus solely on the big brands. There is also a similar movement in Finland to start up private import as what our business is all about, and that is what many of the wine-geeks go for. Llagrima d’Or is also available as private import, so if you are interested, send me a message. Congratulations Sweden! This is the day that all of our hard work is rewarded, Llagrima d’Or is once again available for purchase. It was a long journey to this point with change of company structure, country and logistics, but it feels great to have reached this point. Our webshop opened this morning and will close on the 12th of April. After that the precious Cavas start their journey from our warehouse in Denmark to Sweden and to your doorstep. Have a peak at our website on whats available and remember quality is not a coincidence! With the right kind of care, love and craftsmanship (and of course Cava-talent) good Cava is a given! Just when you thought I cannot possible have any more reviews of wine shops from our last trip to London.. The wine shop at Selfridges is a really a nice place to browse around in. It is located at the bottom floor of the iconic department store on Oxford Street, and they actually do not only carry a respectable assortment of wine but also an impressive selection of beer and other spirits. The wine selection is also a very good mix between the big name brands mixed up with some smaller producers to appeal to those who want to try something new. The price level is above the average wine boutique or online store but not so much to prevent me from shopping there. It is however good to have a view what the fair price is as some of the wines are a lot more expensive while others are reasonable priced. Wonder whats in this one? The selection of English sparkling wine is impressive. I have not tried that much of then, mainly due to my suspicion on poor-ish price vs quality ratio, but it has tickled my interest (perhaps I should do a tasting round to get some more insight on the situation). The selection on Champagne is also very nice with some smaller producers represented in addition to the big names. Selfridges has their own private label Champagne from Henri Giraud that I am also aching to try. The staff are knowledgeable and very service-minded, but if you would like to have a proper chat, I would suggest not visiting on the busiest hours of the weekend. There are also a few tasting machines, not as extensive as the Sampler (review here) or Vagabond Wines (review here) but something to entertain you for a little while. All in all you can have a very nice shopping experience at Selfridges and it is a good combination some other purchasing activities from the luxurious department store. For example, having a few nice tasters of wine and then heading to the shoe department works very well for me (not that well for my wallet). Following yesterdays review on the Kloof Street Swartland Rouge, I thought it would be nice to write something about the shop where I bought it from, Handford Wines in London. It’s a nice little wine shop in South Kensington, with an interesting selection of wines from around the world. I mainly ended up here on my way to the Sampler (review here). It’s a cute space with high shelves bulging with wine. I get this old library feel, but instead of books, there are bottles. If I am not mistaken the shop was once occupied by wine merchant La Vigneronne. It is a short walk from South Kensington tube on the slightly charmless Old Brompton Road. The staff are friendly and knowledgeable and happy to chat about wine. I had the pleasure of trying some interesting Canadian (!) wine from the Niagara Falls region that they were sampling. You don’t run into Canadian wine that often here in Europe, and at least I was very unaware of this wine-region before driving through (from Toronto the Niagara Falls) on a holiday trip in 2010. The Niagara Escarpment (a ridge carved by ancient glaciers) has a good microclimate with fertile soil and adequate rainfall to support vine growing. Looking back to 2010, I remember the excitement when I realized how close I was to all these boutique wineries. However, my travel companion at that time could only be convinced to visit Wayne Gretzky Estates (Finnish men!). Well, that was better than nothing. The Canadian white wine I tasted at Handford Wines was perhaps too sweet for my taste but I am always very happy when invited to try something new. It also highlights the depth of the selection they carry. What Handford is really great for is wines from South Africa. They are numerous and there is a nice selection from different regions. In addition to the Kloof Street we picked up a Pinot Noir from Cape South Coast (the name really appealed to M: Mr P Knows). There is also a very good selection of French wines and interesting stuff from Portugal and Spain. The prices are decent but the ‘cheaper’ bottles in general seem to be worse value than bottles of £15 and above. If you are in the area (or searching for some South African or Canadian wine) I recommend popping by. This is perhaps not on my list of top-visits for London wine-shops, but that might change if I get hyped up about South Africa. Right now my focus is on Spain and Portugal (and Champagne), but you never know what’s next. I am insatiable when it comes to learning more about wine. Fortnum & Mason is truly one if the iconic stores in London. They are perhaps most known for their teas and biscuits, but amongst the usual department store selection, they have a nice food hall and wine department on the lower ground floor. The atmosphere and look of their flagship store on London’s Piccadilly is really nice, so worth a visit even if you are not in the mood to buy anything (you may however be after you see their Champagne shelf). There is also a wine bar in connection to the wine department, so if you get really thirsty, relief is only a few steps away. The food part is made up of numerous counters for cheese, charcuteries, meat, fish etc. It all looks very nice and the staff are knowledgable. However the price quality ratio is perhaps not wallet friendly so one ends up paying extra for the shopping experience. I would much rather shop at the local butcher or for example at Maltby Street Market and get a more genuine experience and better prices (and potentially better quality as well). Still if you want to get in the mood for food this is a good place to visit. The wine store is not huge but they do carry a fairly impressive range if wine (a bit over 1000 different ones) and prices are surprisingly reasonable. The selection is heavy on wines from France, so as to be expected, Champagne takes probably a fourth of the floor space (not complaining). Still it somehow fails to excite me as the selection is quite “main stream”. A bit like Hedonism wines (review here), they focus on big brands and also their private label wines. For those of you who are not familiar with the term private label it is the stores own branded products produced by another producer but sold under the store name (in this case Fortnum & Mason). The UK market is extremely developed when it comes to private label food and beverages, so it is no surprise that there is also a lot of private label wine. I am not always the biggest fan of private label Champagnes, but one can make quite interesting finds in that category. The producer of the wine is always displayed on the label, so I go around peaking at who is responsible for the quality. The producer of the F&M Rose is Billegart-Salmon (love their non-vintage rose), the Blanc de Noirs is made by Déthune and the Blanc de Blancs by Laurent Hostomme. They also have a new private label Franciacorta! The look of the bottles is quite stylish and they do a lot of cute packaging. I love their coolers with baby blanc de blancs, perfect for a summer picnic (for people who do not want to share). The prices are very reasonable ranging from £29,50 for the blanc de blancs to £35 for the Rose and £49,50 for the Blanc de Noirs. On our last trip (over new year), we had already stocked up on so many wines, that we decided to leave the Fortnum & Mason stuff behind, but definitely on one of our next trips we will be looking at bringing back some of the private label Champagnes for a tasting. I also saw Selfridges doing an interesting private label bubbly produced by Henri Giraud (brut £29,99 and rose £37,99) and someone also had a champagne by Delamotte. Even an iconic wine merchant like Berry Bros and Rudd do their own private label wine these days. I am not always convinced that the private label stuff comes from the same batches as the producers own branded products (I really have no idea), but at least there is real knowledge behind making the wines. And who knows, maybe you can make a real bargain. Hedonism Wines is like a candy store for wine lovers. It is a lovely place to browse for wines as it has one of the most extensive selections of high end wines and big name brands I have ever seen. With a central location (in Mayfair) I often end up at Hedonism browsing around the shelves and crossing my fingers I win the lottery. The atmosphere is great for getting in the mood for wine and staff are friendly (although level of knowledge varies greatly depending on who is working). They also have a decent selection of other liquor, some wine books and glasses. All in all, its a beutiful store. So why do I conclude that its only mediocre? For me it is the fact that regardless of the great selection I seldom find anything to buy. That largely comes down to two reasons: first the selection is extensive but to some extent fairly boring is at is the big names that dominate here and I am often searching for smaller producers (that is just not the focus of Hedonism). Nothing wrong with that but in combination with a “ridiculous” price level it just does not make it my place to buy. Hedonism is often substantially more expensive than other shops and I am often ready to go the extra mile to find a good deal. I have seen cases where Hedonism charges up to double that of what others have on the price tag, but more normal is around 20-50% more. One can always argue that a nice location and large selection is not cheap to maintain, but we are living the era of internet buying and home delivery, a nice shop is an unnecessary extra for me. For the really high end stuff (stuff for a few £1000s) they are however more competitive so it seems they try to have higher margins on their ‘cheaper’ (thinking of the wines costing £50 and up to a few £100). Regardless of the price level I still think Hedonism Wines is a place well worth wisiting. 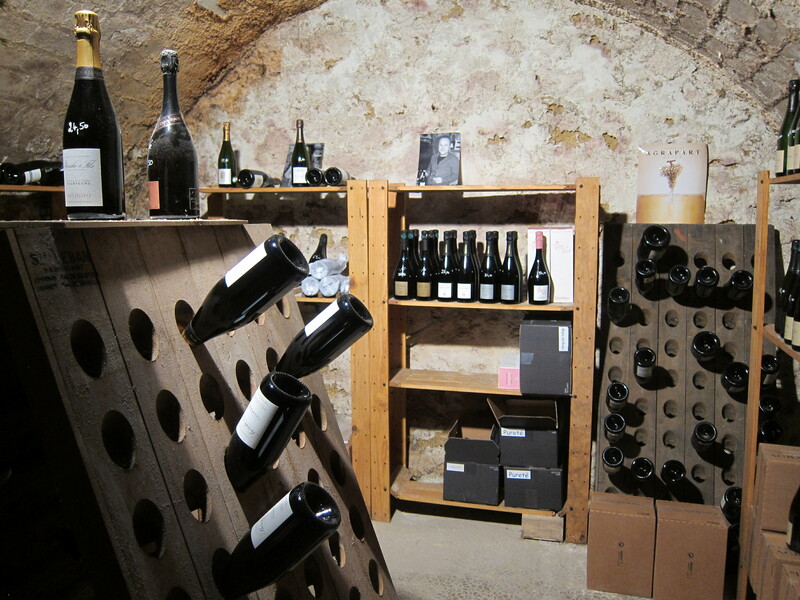 If you are interested in some high-end Champagnes, they have a room with a nice collection of for example vintage bottles of Krug, Bollinger and Dom Perignon. Perhaps not something I can afford (or at least willing to spend the sums required) at the moment, but still nice to have a look at.